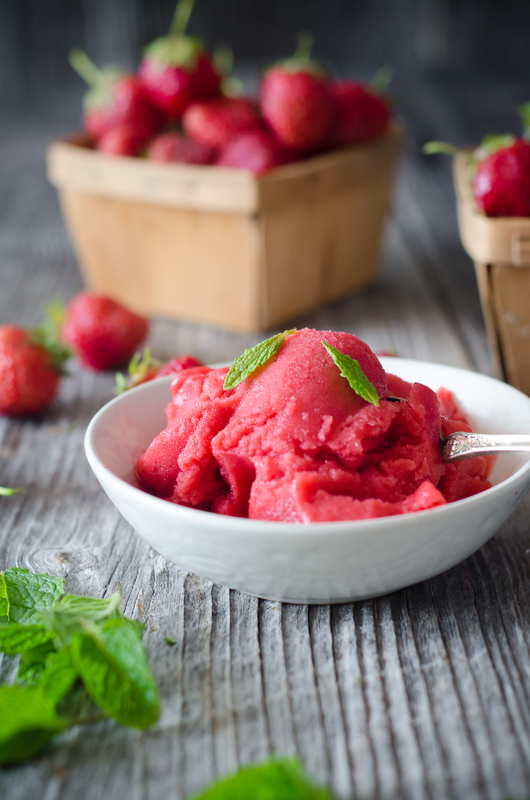 Strawberry mint sorbet is one of those desserts – those simple treats – that I love sharing with my family. It’s fresh and vibrant with flavor, but also utterly uncomplicated. It celebrates some of the first flavors of springtime, strawberries and fresh herbs, combining them with honey for a touch of sweetness. Mint helps to cleanse the palate, making this sorbet a particularly nice treat to serve after dinner. Warm the honey in a saucepan with water until bubbles begin to form. Drop in the mint, and turn off the heat. Allow the mint to steep in the diluted honey until it cools completely. Toss the strawberries into a high-powered blender (like this one), then strain the honey through a fine-mesh sieve (like this one) into the blender, discarding the mint. Add the lemon juice, vanilla and peppermint extracts to the strawberries, and blend until smooth. Pass the liquid through a fine-mesh sieve into a jar, seal, and store in the refrigerator at least eight hours until thoroughly cold. Pour the liquid into a ice cream maker (This is the one I use.). If using frozen berries, allow them to thaw completely first. Strawberries are rich in phytonutrients, and are a particularly good source of vitamin C as well as manganese, a mineral that helps the body to form connective tissue and that plays a role in carbohydrate metabolism and the regulation of the body’s blood sugar. In addition to containing a wide variety of vitamins and minerals, strawberries are also rich in various antioxidants. Researchers have found that these compounds in strawberries can help the body to detoxify free radicals as well as protect and repair DNA (read it here). 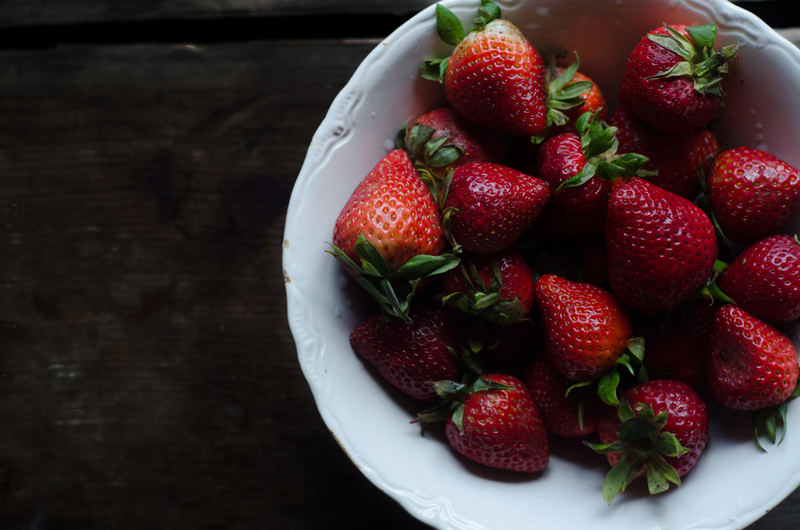 While you can find strawberries in the produce case at your supermarket throughout the year, strawberries are best in late spring to early summer, when you can find them for a fair price at many farmers markets and at u-pick farms. Do strawberries lose nutrients in the blender or freezing? No, no fruits will lose nutrients in any significant or notable way through blending, and nutrients are very well preserved through freezing. Is there a way to do this without an ice cream maker? Perhaps just freeze it? No, you really need an ice cream maker for this one. But you could freeze them in Popsicle molds instead. Thank you for the alternative idea! I gave away my ice cream maker a few months ago!! Great recipe! Strawberry season is upon us here! Delicious! Made this the other night. Saved a little of the mix in the ice cream maker to make an adult beverage with it before making the sorbet for the kids;). Both treats were fantastic! How wonderful, another splendid recipe, thanks Jenny. In Queensland, our strawberry season is just about to get into full swing. At our state show, the Brisbane Exhibition ( or the Ekka) as it is fondly known, they have the strawberry sundae stand. They go through 10 tonnes of strawberries and all the fruit comes from south east Queensland. The also use a local icecream and use 19,000 litres of beautiful strawberry icecream which is exclusively used for this fundraiser . On average 140,000 sundaes are sold each year with profits going to The Prince Charles Hospital Research Fund. Who knew such marvellous money can be raised with the help of the sensational strawberry. This sounds fabulous especially in 100+ degree weather here in AZ! Thanks for your awesome recipes!